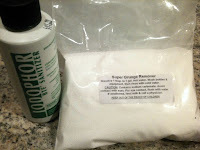 A few of my forthcoming blog entries for VeganMoFo 2011 will document my attempt to brew some beer. I've been muttering about brewing beer for several years, but I never seemed to get around to doing it. Many of my beloved friends grew weary of these mutterings and collectively shipped me a home brewery for my birthday this year. It is now time for me to stop muttering and to start brewing. Can you confirm that this product meets my criteria? All the ingredients in star San are on the GRAS (generally recognized as safe) list. This means they don't need bunny testing. You are good to use all five star products. No they are not animal derived. Thank you, Jon! I feel bad about pestering him while he's on the go, but it's worth it to move forward with confidence in this long-overdue endeavor. Yeah, I thought "bunny testing" sounded a little patronizing, too. Glad you followed up. My sweetie's been wanting to get into home beer brewing. When we saw Sandor Katz recently he encouraged us to go for it, noting that you don't need a lot of fancy equipment to get started. It looks like you have a bit of fancy equipment. I'm excited!! I have tried twice to respond to your information request regarding BTF Iodophor. Please send your inquiry again with a back-up email address. For some reason the original one sent continues to have some issues. Thanks much and welcome to the wild and wonderful world of brewing! mlandman, thanks for your comment! I did eventually get your excellent e-mail; my server was suffering some DNS issues. My response is brewing. adriennefriend, thanks for exposing me to self-proclaimed "fermentation fetishist" Sandor Katz. Fascinating. A Vegan, Pre-packaged Starbucks Food? I'm going to run a half marathon!